How do I keep dust, dirt, fingerprints, & dents off my pieces? Perhaps I have stolen this tip from past music teachers (I did, by the way) … but one of the things both my piano teacher & saxophone teacher insisted on was short nails. Why? Because short nails make for better dexterity and less interference. I took piano or saxophone lessons for 20 years and I was required to have short nails. I see lots of polymer clay artists who clay with long nails & I am envious. I don’t know how they do it. Alas, it doesn’t work for me. Having short nails means that you won’t get any accidental gouges or marks on your pieces, unless you put them there yourself. Long nails tend to hold product and trap it (clay, mica powders, fibers from your jeans, etc). 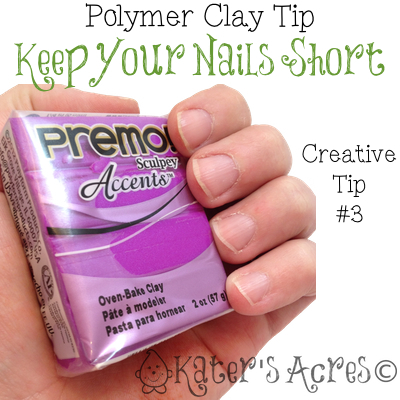 This means that every time your nail gets near your clay, you could be adding those elements into your projects. Yuck! Having short nails allows you to use the tipity top portion of your fingers for shaping & sculpting and will leave less fingerprints than using the pads of your fingers. If you are getting random fibers, marks, stray bits of clay in your work it is most likely from your work surface. The secondary reason is from your hands. The best ways to prevent it: use lotion & have short nails (for all the reasons above). Do you have short nails or long nails? Which do you prefer when working with clay? Please share your thoughts in the comments below. I keep my nails very very short. I am curious if anyone who gets “gel” manicures have had any reactions to it. It is a long lasting uv cured nail polish. I know it dulls the shine when I polish or sand my pieces.